It has been a day let me tell you. I am so happy to be home and writing about this blog post about one of my favorite movies and probably my favorite Hitchcock film. 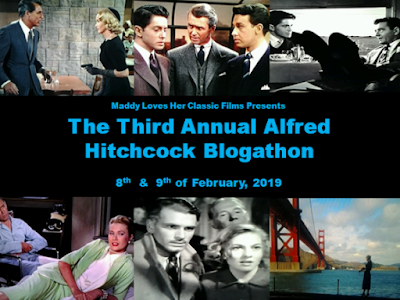 And I want to thank Maddy Loves Her Classic Films for putting on this little blogathon. 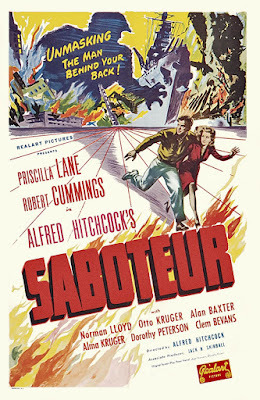 Saboteur came out in 1942 and it stars Robert Cummings, Priscilla Lane, and Norman Lloyd. Barry Kane (Cummings) is accused of starting a fire at the aircraft factory he works at. His friend Mason was killed in the fire after he had been handed a fire extinguisher that had been filled with gasoline. Kane believes it was another co-worker by the name of Fry (Lloyd) who actually started the fire, but since police can't find his name on a list of plant workers they make the assumption that Kane is guilty. Kane takes off to try and find Fry. Along the way he takes refugee with a blind man and his niece. 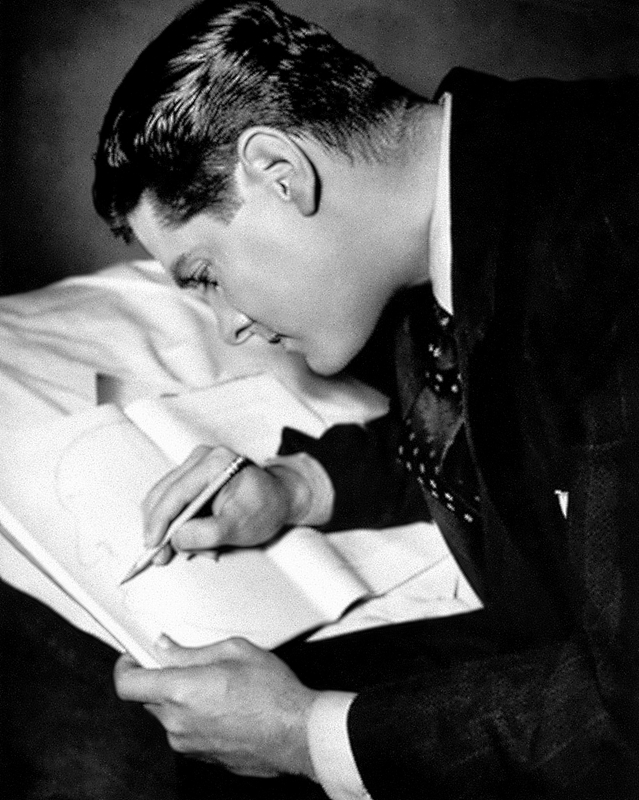 Pat Martin (Lane). Her uncle asks Pat to take Kane to the blacksmith shop, so someone can remove his handcuffs. 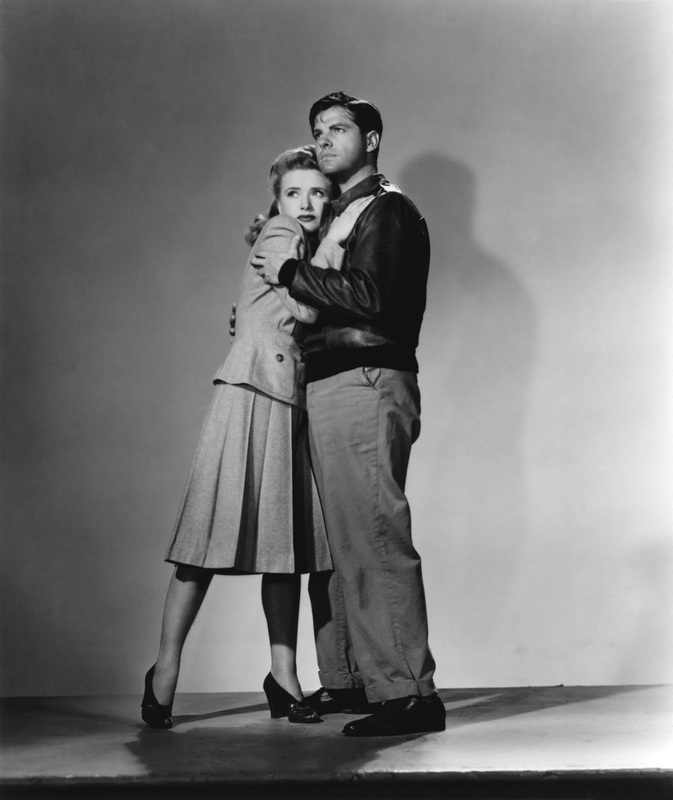 However, she tries to take him to the police and he kidnaps her to prove that he is innocent. He uses a part of her car to break his handcuffs and it breaks down. Kane and Martin spend the night hidden on a circus train. The performers know they are on the run from the law and shield their whereabouts from the police. They reach the city where they think Fry is hiding and discover a plot to blow up a dam. After he convinces the people who are going to do it that he is with them, he is able to stop it from happening. Kane finds out that they plan on sabotaging the launching of a navy ship at the Brooklyn Navy yard. By now he has everyone convinced he is a bad guy, including Martin, who contacts the police. The saboteurs take Kane and Martin to New York with them. There is where Kane is locked in a cellar but is able to escape by setting off a fire alarm. Martin is trapped in an office building, but is able to signal for help by dropping note out the window, which is discovered by some cab drivers. Kane is able to stop Fry from setting off an explosion in the Brooklyn Navy Yard. But the final scenes on the Statue of Liberty are some pretty amazing scenes. This is one of those movies where I really don't want to spoil the movie, like I usually do. 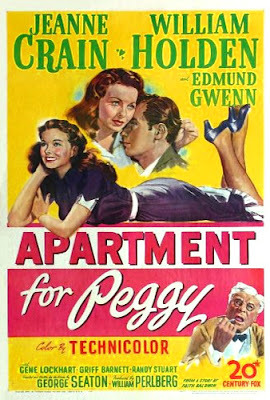 Like I have said before, this is my favorite Alfred Hitchcock movie. I remember first seeing it for the first time, it was after I had seen Moon Over Miami for the first time. I was on a Robert Cummings kick and I enjoyed it a lot. I had seen other Hitchcock films before, but this one stood out to me more than the others had. I highly recommend this movie if you haven't seen it. The cinematography and acting are amazing. And of course the ending is a good one! This post was written for The Third Annual Alfred Hitchcock Blogathon. You can find all the other posts here. Great review! This is an interesting movie that hasn't gotten enough attention. It has many wonderful vignettes. Amazingly, Norman Lloyd is still with us! Thank you! I agree, this movie doesn't get a lot of attention. It is my favorite Hitchcock film and I wish it got more attention. I know! Isn't he like 104 now?